The cottage, shown here with its double entrance and widow’s walk, was originally built in 1999 by Eider Construction. Led by project manager Patrick Verville, Wright-Ryan Construction renovated in 2018, adding a separate structure that has a garage below and screen porch above. The living room has fifteen small framed Audubon prints, all of birds of Maine. The homeowners wanted another bird picture that wasn’t an Audubon for the space. Fremont-Smith sourced the tree with birds, a large watercolor on silk, at Hurlbutt Designs. 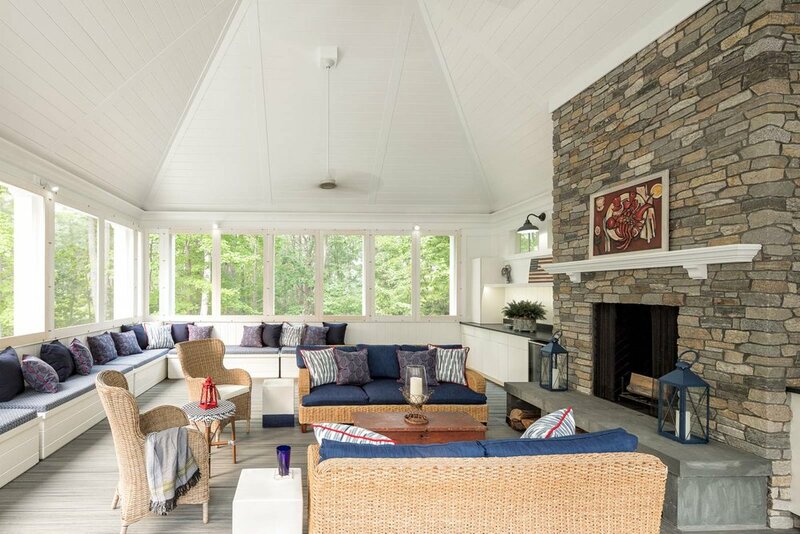 The room is entirely open to the neighboring sunroom but is still defined by clerestory windows and French doors. A turret space with built-in seating is just out of view to the left. Interior designer Leandra Fremont-Smith tweaked the color she chose for the foyer’s ceiling for this new pantry. The emerald Roman shades are in fabric from Schumacher. The floor is a gray herring bone porcelain tile. The new kitchen has two prep areas, as well as a clean-up area, to improve functionality. The layout is loosely based on the homeowners’ kitchen in Chicago. Two different finishes for the white oak Rutt Cabinetry make the kitchen feel beachy yet sophisticated. The stools and stainless-steel strip on the island and kitchen hood add a slight industrial edge. 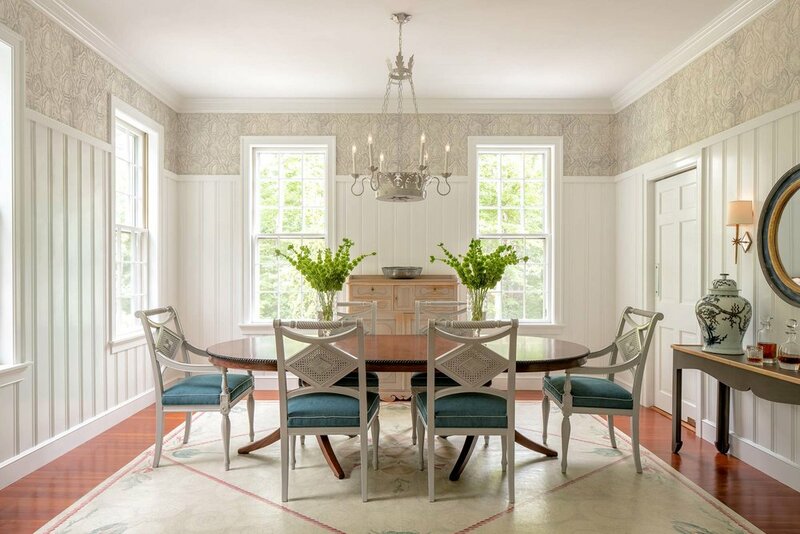 The kitchen addition made room for a French-inspired round oak table and side chairs of woven plastic and rattan (from Serena and Lily). Just out of view, a cushioned banquette provides additional seating. It has a faux leather cushion and built-in storage beneath the seats. The door opens onto a deck with a catwalk to a second-floor screen porch in a separate building. “We wanted to take advantage of the outdoor space,” says one of the homeowners of this screen porch that sits atop the garage and links back to a deck outside the kitchen through a catwalk.